Happy 2015 everyone! I hope you all enjoyed the holiday season. I love all of the festivities and eating events that this season presents, but have to admit that I (especially my waistline) am relieved when the New Year arrives, and I can focus once again, on fresh, healthy meals. It seems that as much as I am determined not to over-indulge in sweet, rich food at Christmas time, I am lured into eye-popping calorie counts with not enough time to exercise it all off! So today I am welcoming the New Year with a divine salad that I discovered in Yotam Ottolenghi’s latest cookbook, “Plenty More”. 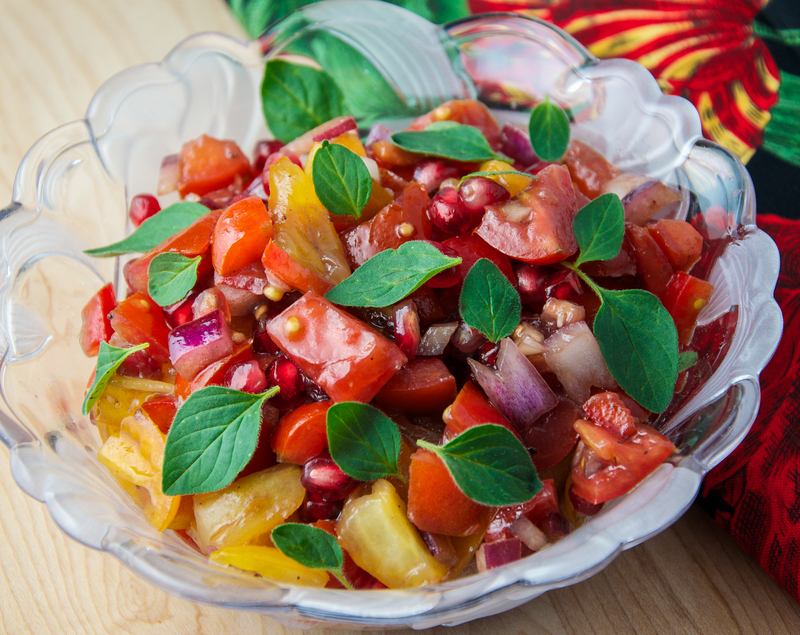 Let me assure you, that you can load your plate high with this delicious, colourful salad, and not have to worry about running a marathon to burn it off. Another advantage is that if you are still celebrating the holidays, it is gorgeously festive. I hope you all enjoy it. I will be bringing a big bowl of my salad over to Angie’s Fiesta Friday to share with my blogging friends. I know that many of them will appreciate a lighter dish after all of the rich food we have been consuming. Please come and join us at The Novice Gardener and Happy New Year to you all! Mix together all of the tomatoes, the red pepper, and the onion in a large bowl and set aside. In a small bowl, whisk together the garlic, allspice, vinegar, pomegranate molasses, olive oil and a pinch of salt, until well combined. Pour over the tomato mixture and toss, gently. Arrange the tomato mixture and its juices on a large, flat plate. Sprinkle the pomegranate seeds over the top. Finish with a drizzle of olive oil, and serve. Load your plate high with this one! Mop up the juices with some thick, crusty bread! Happy 2015 to you and yours, dear Julianna! This is beautiful and looks good enough to eat! When I read this title I thought tomatoes AND pomegranates? Love both but not together. Then I saw the source and well all was right with the world. Love Ottolenghi and his bold combinations of flavors. Gorgeous salad I will have to try. Happy New and Healthy Year, Juliana! Happy New Year to you too, Johanne! I agree about Ottolenghi! I love everything that I have cooked from his books! All the best for 2015! Gorgeous and healthy to boot!!! Happy New Year! Just whatbi need after all the feasting Chef! Yumm and rich and nutritious! looks wonderful! I really need to use more pomegranates.. thanks for sharing at FF49! and HNY 2015 to you also! So beautiful, I love all the flavors and colors in this dish, and you’re absolutely spot on, that’s what we ALL need after a month of celebrating with rich foods. 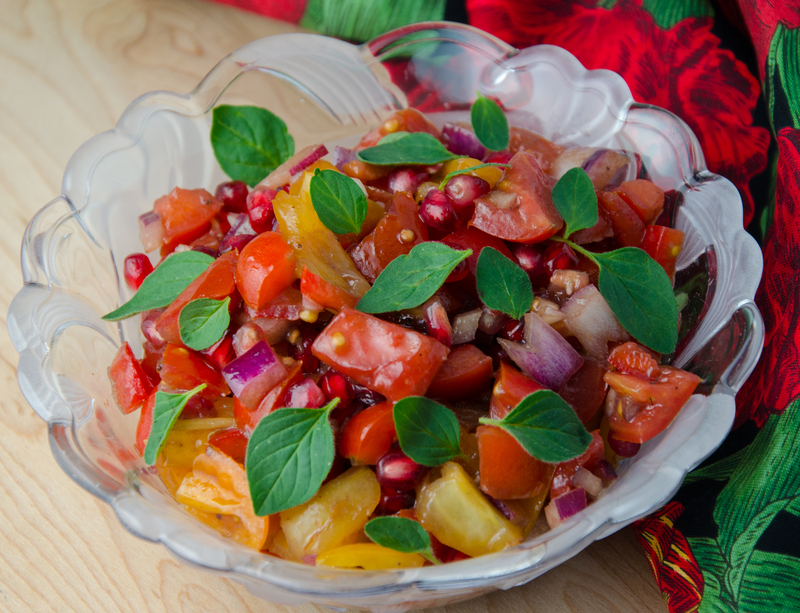 This is a very refreshing and healthy salad to have after all the holiday indulgences….Thank you Foodie on Board for sharing this wonderful recipe. Happy New Year Everyone! Thanks so much, Linda! Happy New Year to you! My eyes are feasting on this beautiful salad! I love all of the flavors and textures your’ve combined here. I too am looking forward to getting my diet real! What a pretty and colorful salad! Great idea for a salad! Love this recipe! Really happy that you love this! This is most welcome after all the partying and bingeing Chef 👍 I would like to skipe the white wine vinegar though. How about cider vinegar or just lemon juice? Beautiful salad, Julianna! It’s the perfect dish to focus on healthier eating without feeling deprived. Happy New Year! Sounds like a wonderful blend of flavors and wow, look at all those gorgeous colors! Yummm……nice start to the New Year too, Julianna. You are too kind, Geraldine! Thanks so much for the encouragement! 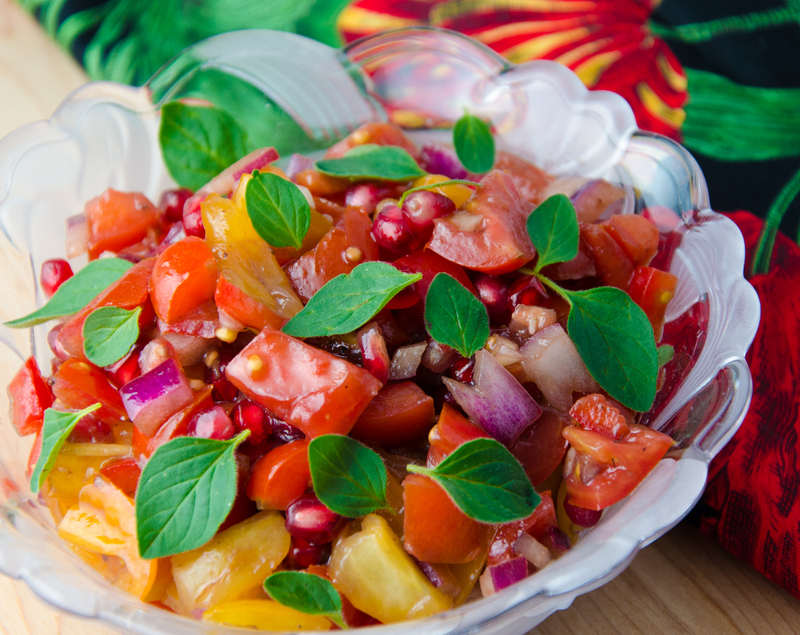 What a beautiful, cheerful looking salad!